In the spring of 1862, the 1st Michigan Cavalry crossed the Potomac at Harpers Ferry to start the Valley Campaign. Thomas hung the flag out the Charles Town Court House window. When it was retrieved, it had suffered its baptism by fire as it now contained five bullet holes, believed to have been shot by local women. 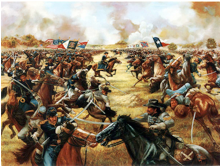 Sheppard saw the elephant as he carried the flag into battle for the first time at Kernstown, March 23, 1862 where Jackson suffered his only defeat in the Valley at the hands of Col Nathan Kimble. Sheppard continued to fight in the valley and later in the piedmont through second Manassas and again in defense of Washington DC. In December of 1862 Sheppard was assigned to recruiting service in Michigan. In November, he was furloughed home to Almont. In December, he returned to the defenses of DC. Sheppard and the 1st MI continued through the confederates splitting the line. Sheppard suffered saber wounds to his shoulder and foot causing him to be de-horsed behind the charging confederate lines. The fight continued with elements of the other Michigan regiments and McIntosh’s units attacking the flanks, resulting in the confederates withdrawing. Sheppard, understanding he was about to be captured, removed the flag from its staff and hid it under his uniform. He was taken with the retreating army to Richmond and imprisoned at Libby. Soon after, he was transferred to Belle Isle prison camp in the middle of the James River. In February of 1864, he was loaded into a boxcar, along with most of his fellow prisoners, and transported to Andersonville prison, being among the first to arrive at the new facility. As Sherman approached Atlanta, Andersonville began to transfer prisoners with Sheppard moved to Macon, then Milan ending in Savana. He was released at Venus Point Ga Nov 18 1864. A total of 505 days in rebel prisons. All through the ordeal he kept the flag hidden from the guards and fellow prisoners who would turn him in for a reward. Sheppard was then moved to Camp parole, College Green Barracks, Annapolis, MD. On Dec 10, 1964 he was furloughed for 90 days to Michigan and on March 27, 1865 received his Honorable Discharge. 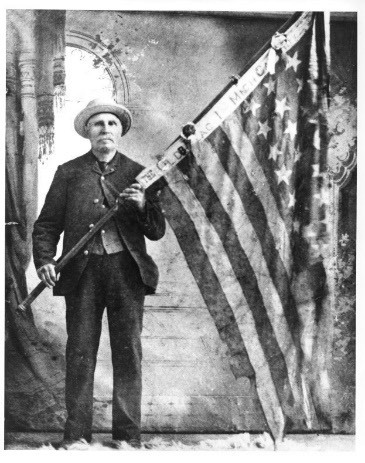 On April 6, 1865 he Enlisted in Hancock’s Veterans Corps. He received his second Honorable Discharge April 5, 1866. He returned to the thumb region of Michigan where he farmed and worked as a carpenter. In 1868 he managed the brand new hotel “The Northern” for the next several years, which he had helped build. In late 1872 his wife was severely injured when the buggy she was driving flipped back as the horse reared. She died a few days later on November 22 after bearing ten children. A year later Thomas married Anna Williams December 25 1873. They had four children including my grandfather who was born May 2, 1878. 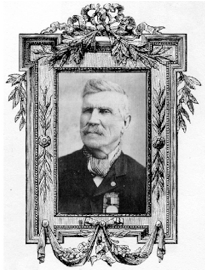 Thomas Henry Sheppard was a member of the Wilson/Roger Post 336 of the Grand Army of the Republic. He died March 5, 1901 and is buried at the Imlay City cemetery. 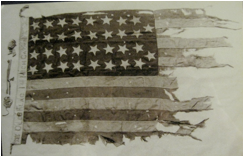 The Flag can be viewed at the Dearborn Historical Museum, Dearborn, Michigan.